We all know that aside from the obvious physical and emotional challenges facing the visually or multiply impaired child, these children are at a disadvantage to their non-impaired peers in terms of cognitive development in that they are less apt to "explore," and thus, learn at those critical early ages. In contrast, their non-impaired peers seem to be exploring and learning very quickly at this stage of development. By systematically and routinely placing a visually or multiply impaired child in the Noisy Box for undisturbed "free play" and "exploring" sessions, the child "nests" in this cozy, non-threatening environment. Once the child begins to feel comfortable and safe here, the real progress begins. The concept and design of the Noisy Box promote the development of object permanence, spatial relations, cause and effect, and memory skills by encouraging object manipulation and independent play in a non-threatening environment--all skills that seem to come naturally and quickly to their non-impaired peers. Because of the close-in walls and ceiling, sounds created by the child's play or voice become amplified and somewhat isolated or insulated from background noise, further enhancing the child's experience. 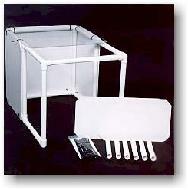 Each Noisy Box frame is constructed of high-quality furniture grade 1" diameter PVC tubing and fittings. The legs which connect the top and bottom frames are removable so that the Noisy Box can be quickly collapsed flat, placed in the convenient tote bag, and easily transported (for itenerant VI Teachers.) 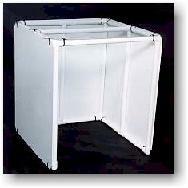 Side and back panels are constructed of PVC sheets. 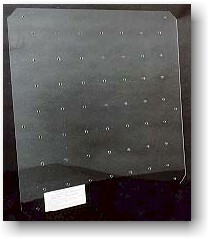 Top panels are constructed of 1/4" Plexiglas for visual supervision and monitoring, with 3/8" holes drilled for objects to be suspended for the child's manipulation. Our most popular product; height is adjustable to 1' or 2', depending upon child's size. Includes frame, one set of 1' side and back panels, one set of 2' side and back panels, one standard Plexiglas top, 25 panel fasteners, and canvas tote bag. Used primarily for larger children and children who are sitting upright or with an assistive seating device. 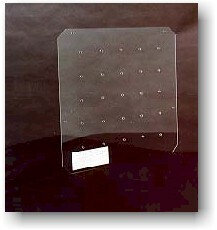 Includes frame, one set of 3' side and back panels, one large Plexiglas top, 25 panel fasteners. The Noisy Board (resonance board) is designed to encourage the child's reciprocal movement by amplifying sound, increasing vibration, and providing tactile feedback. The Noisy Board is designed to be used as a platform upon which to work with a child using the Noisy Box, but is also used by itself. The Noisy Board is constructed of 1/4" birch plywood, mounded on a hardwood frame, sanded smooth and finished with two coats of polyurethane. Used in conjunction with any noisy box, enhancing the child's Noisy Box experience, or used by itself. Used in conjunction with any noisy box, enhancing the child's Noisy Box experience, or used by itself. 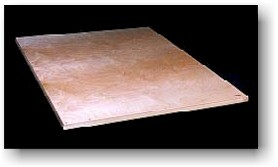 Shipping and handling charges are typically higher for oversize items such as the Large Noisy Board. If ordering three or more of these items, please call us at 1-877-324-2533 for a shipping quote to obtain the best rate. We offer several accessories which complement the Noisy Box. Extra Plexiglas tops give you more mileage from your Noisy Box in a classroom setting because you can designate different tops for different children, each with his or her own set of toys and objects. This flexibility saves you the time and trouble it takes to remove one child's toys/objects and either disinfect or replace with another child's toys/objects. We offer extra panel fasteners in the event that those provided with your Noisy Box eventually wear out from extended use or become misplaced. We offer an Accessory/Object Package which includes 10 toys and objects, 15 cord locks, and elastic bands with which to suspend the toys and objects. The package includes toys and objects which are designed to provide the child with auditory and/or tactile feedback. Used in conjunction with the Standard Noisy Box (#1101.) Ideal for a classroom environment so that one Noisy Box can be used with several children by simply "swapping-out" tops with toys/objects already attached, instead of removing, disinfecting, and repositioning them for the next student. Saves your program time and money! Used in conjunction with the Large Noisy Box (#1201.) Ideal for a classroom environment so that one Noisy Box can be used with several children by simply "swapping-out" tops with toys/objects already attached, instead of removing, disinfecting, and repositioning them for the next student. Saves your program time and money! 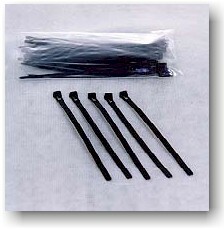 Replacement fasteners for worn or mis-placed fasteners. For use with all Noisy Boxes. Includes 25 fasteners. Used in conjunction with any Noisy Box. Ideal starter package from which to build an inventory of toys/objects appropriate for specific student needs. Includes 10 toys and objects for use with noisy boxes, 15 elastic bands and cord locks with which to suspend toys/objects. Contents: 10 Toys/objects, 15 elastic bands, 15 cord locks, logo storage bag.